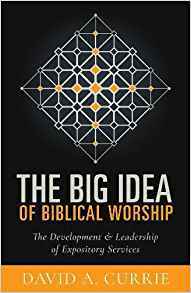 The Big Idea of Biblical Worship: The Development and Leadership of Expository Services, by David A. Currie. Hendrickson, 2017. Paperback, 184 pages, $14.95. Reviewed by OP pastor George C. Hammond. Most of our ministers work hard to accurately and compellingly communicate the Word of God each Sunday. Does the service of worship that is the context for their sermons aid the message or detract from it? Anyone who has been present in churches for any length of time can sadly tell of instances of hymns or other elements in the service that smacked of being at cross purposes with the message of the text, such as singing “Jesus Paid It All” after a message on the enduring necessity of tithing, or “You ask me how I know He lives? He lives within my heart!” after an Easter sermon on the historical and factual “many convincing proofs” by which “Jesus presented himself alive” (Acts 1:3). Using the “big idea” method of Haddon Robinson’s approach to preaching, David Currie applies a rubric that enables those responsible for planning and leading the worship service to construct a service that underscores, enhances, and reinforces the message of the biblical text preached, so that what is presented each Sunday is a unified whole. Currie begins by defining biblical worship: “Biblical worship is lifted up when the whole Word of God guides the whole person together with the whole people of God into the full presence of the Father in full union with the Son through the full power of the Holy Spirit to further the fulfillment of the whole mission of God.” Pastors and elders will recognize the familiar dialectic principle in which there is an alternation of God’s speaking through his Word, and the response to God by the congregation. Currie then notes the importance of, and gives practical ideas for, selecting passages for the services of worship and developing liturgical (worship) ideas that are consonant with the homiletical (sermon) ideas. From this principle, he takes the reader through the development of five liturgical movements that he argues should characterize every act of corporate worship: rejoice (what should we praise God for? ), repent (what should we confess to God? ), request (what should we ask God for? ), sacrifice (what should we lift up to God? ), and service (what should we live out for God?). Resisting formulas, Currie does not advocate a particular order of service for every church, but rather gives principles that are biblical and applicable to any church, urban, rural, Western, or non-Western. The last chapter and conclusion of the book are dedicated to the principles of building a worship-planning team (whether made up of only the elders, or with wider participation), with practical but theologically astute insights into handling differences in perspectives on worship. The book is an excellent aid to those planning and leading services of worship. Worship is the context for the sermon, and the sermon is a part of the worship. This book guides readers into crafting a service of worship that glorifies God, evokes adoration, and leads to a unified and unifying message. This reviewer believes it would greatly benefit pastors, elders, and others (including musicians) who help to plan or who lead in worship.